Peter Tork Of The Monkees Dies At 77 An adept musician in a pop band dismissed as made for TV, Tork became famous with the Monkees in the 1960s. Their reunion tours lasted well into the 2000s. 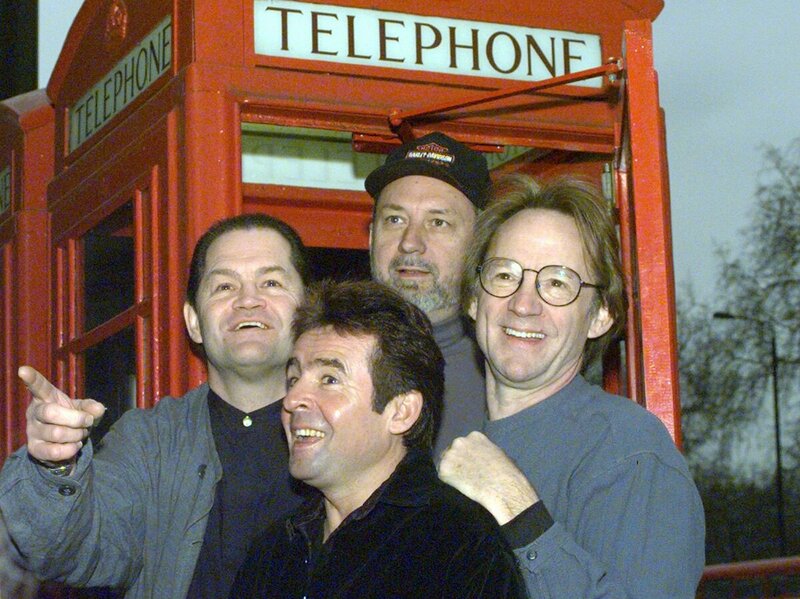 The Monkees (from left: Micky Dolenz, Davy Jones, Mike Nesmith and Peter Tork) pose in front of a London telephone booth in 1997. The Monkees were a made-for-TV musical group whose comedic high jinks and misadventures were fashioned after the Beatles' classic films A Hard Day's Night and Help! Their show debuted in 1966 and lasted only two seasons. But it did win an Emmy in 1967 for outstanding comedy series. The Monkees became overnight stars, producing a series of No. 1 hits such as "Last Train to Clarksville," "Daydream Believer" and "I'm a Believer." Their record sales in 1967 surpassed the Beatles and the Rolling Stones combined. Despite their commercial success, including six Top 10 songs and five Top 10 albums, critics hammered them for their manufactured pop cultural genesis and the fact that, initially, they didn't perform on their own records. "Almost all of their early material was penned by a stable of vaunted songwriters that included Carole King, Gerry Goffin, Neil Diamond, David Gates, Neil Sedaka, Jeff Barry, Tommy Boyce and Bobby Hart," according to the Washington Post, and "the songs were mostly done by session musicians." But their popularity was real. Eventually, the band took control of its work and played its own instruments on its third album, Headquarters. They also began touring to sold-out crowds. For a brief time, their opening act was a young guitarist named Jimi Hendrix. Tork left the group in 1968 and sought a solo career. He struggled throughout the 1970s, was jailed for possessing a small amount of hashish, and wound up teaching high school and waiting tables. Alcohol was also a problem, an addiction he overcame in the early 1980s. A combination of 1960s nostalgia and TV reruns kept memories of the Monkees alive and earned them a new generation of fans. The band had reunion tours every decade since the 1980s. All along, Tork and the others defended the band's musical integrity and rejected the criticism that the Monkees were only a fabrication of older TV producers seeking to capitalize on 1960s youth culture. "I refute any claims that any four guys could've done what we did," Tork said in an interview with GuitarWorld in 2013. "There was a magic to that collection. We couldn't have chosen each other. It wouldn't have flown. But under the circumstances, they got the right guys." Tork was born Peter Halsten Thorkelson in Washington, D.C., on Feb. 13, 1942. Trained as a musician, he played a variety of instruments, including guitar, bass guitar, banjo and keyboards. Another member of the band, singer Davy Jones, died in 2012. As recently as 2016, Tork marveled at the power of nostalgia and the band's ability to draw a crowd, even when most of the music was produced with the aid of side musicians. "This is not a band," Tork told the Telegraph. "It's an entertainment operation whose function is Monkee music. It took me a while to get to grips with that but what great music it turned out to be! And what a wild and wonderful trip it has taken us on!"